Cassandra Dickie and Michael Davis. All photos by Kenneth Ingram. 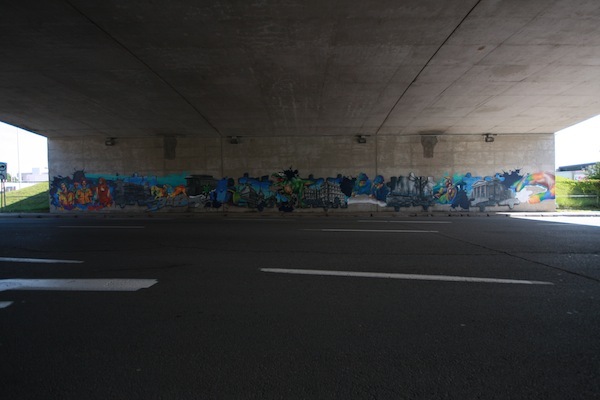 Two concrete underpasses in Ottawa were recently transformed into colourful murals by the hands of local artists and support from city officials. “The city usually chooses proposals for statues and sculptures,” notes Cassandra Dickie, 28, one of four graffiti artists who were given the green light to spray-paint under the Queensway overpass at Metcalfe. Dickie, together with Michael Davis, 34, Phil Laporte, 28, and his brother Dominic Laporte, 24, worked on the mural both day and night for about a week. “There’s also not a lot of opportunities for murals because the locations [of new construction] don’t tend to have large [concrete] walls,” she explained while applying some final touches to the mural on the eve of the official unveiling. “It’s also a nice change, not running away when people approach us while painting,” she laughs, adding that this is her favourite mural so far, partly because of the positive public response and also because of the unprecedented support that the city has demonstrated for “street art”. The artists are members of Ottawa Urban Arts, a collective of about ten members who have created roughly 30 murals throughout the Ottawa-region and also support a youth mentorship program. The mural on Metcalfe incorporates an overriding theme of “Connections” by uniting puzzle-shaped images of distinct communities and icons in the area such as the Rideau Canal; men playing chess in Dundonald Park, Centertown; the Aberdeen Pavilion and for fun, a T. rex sporting 3-D glasses. The other commissioned mural, located at Riverside Drive and Bronson Avenue, was also selected by a jury and features a large peregrine falcon by Christopher Griffin. Both locations were chosen with cooperation of the Ministry of Transportation and the National Capital Commission.